Performers include: Raquel Alessi, Jose Pablo Cantillo, Michael Cudlitz, Rosemarie Dewitt, Ron Livingston, and Gina Torres. As part of the FBI’s Crisis Negotiation team, there’s no situation that Matt Flannery (Livingston) and Emily Lehman (DeWitt) can’t handle… unless it involves each other. They agree to keep their intimate relationship a secret from their workmates — until Matt reveals it to the world during a tense hostage standoff. The announcement causes friction between them and the rest of the team, including supervisor Cheryl Carrera (Tores), analyst Lia Mathers (Alessi), and agent Frank Rogers (Cudlitz). Each episode follows a hostage situation as well as developments in Matt and Emily’s turbulent relationship. The Crisis Negotiation Unit tackle a hostage situation when a corporate executive takes 16 hostages in the company’s boardroom. Another crisis involves a domestic situation that ends with Matt and Emily questioning a decision they had made during the standoff. First aired: July 20, 2007. There’s been no news of reviving the series. • Though the series struggled in the ratings from the beginning, FOX ordered six additional episodes in November 2006, bringing the total to 19 for the season. 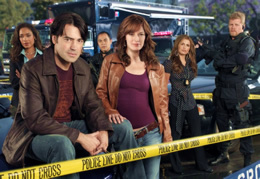 Standoff was put on hiatus a month later and didn’t return until June 2007, well after the network’s announcements of the new season schedule. • The series’ original title was Primary but it was changed just prior to the 2006 advertiser upfront presentation.